September 1st and I thought it time for an update. Well Fed (Mountain Man #4) is with the editor and is currently undergoing the usual resurfacing and bodywork as needed. It’s roughly 500 pages and that’s one book. Price will be around $4.99. The story will focus on Gus and a couple of new companions. I originally thought about splitting the book into a short 30K novella and a larger 119K novel… but, the reader in me didn’t want to do it. Keep checking here or my Face Book page in the weeks to come. I’ll post updates as the book goes through the editing process. If all goes well, and this is very tentative right now, MM4 *should* be available in time for Halloween. I’m certainly hoping it will be ready. All depends on the editing and proofreading. So… the book is done. It’s being edited. It’s big and hopefully it’ll be on the market around the end of October. With luck, you’ll have it by Halloween. 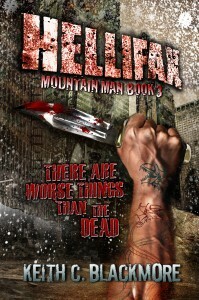 And, finally, the audio version of Hellifax (Mountain Man Book 3) is available here (just click!). Thanks for the info! I’m listening to MM book 3 on audio.com now. I absolutely love this series. I’m thrilled that MM Book 4is such a long story and that Gus is back! Would like to know if audio.com will ever carry any of your other books? Glad you’re enjoying the books. I’m waiting to see if Audible will open up it’s doors to Canadian authors so I can produce the titles myself. It’ll happen eventually. I don’t think I’ve ever been excited for the release of a book until now. This series is amazing and I’m going to check out your other work. Thank you for the stories. Hey there LOVE these books!! I checked amazon and they only seem to have well fed on kindle? Is there somewhere else I can get it on audio? Thanks and please keep writing! !